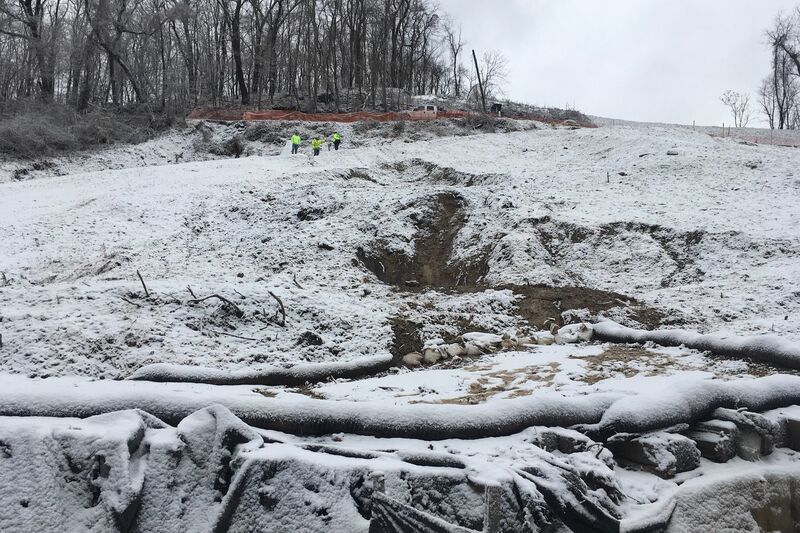 HARRISBURG — State environmental regulators on Friday suspended their review of permit applications and other approvals requested by Energy Transfer LP and its subsidiaries after the pipeline company failed to comply with agency orders following an explosion in Beaver County last fall. Texas-based Energy Transfer owns both the ruptured Revolution natural gas pipeline and the controversial cross-state Mariner East gas liquids pipelines in Pennsylvania. The Pennsylvania Department of Environmental Protection said the suspension will apply to all reviews of clean water permit applications for the company and will affect the in-service date for the Revolution pipeline, which has not started operating after the explosion. The action means that any new construction on company pipeline projects that require DEP approval are on hold for now. Energy Transfer can continue work at sites where it needs no new permits. The Mariner East 2 pipeline, operated by Energy Transfer subsidiary Sunoco Pipeline LP, is flowing partially through repurposed pipelines while construction of the full project’s twin pipelines is completed. It transfers ethane, propane, and butane across the state to a facility in Marcus Hook, Delaware County. DEP said it is currently reviewing 27 approvals for Mariner East 2, all of which are now on hold. DEP Secretary Patrick McDonnell said Energy Transfer, which operates the facility in Marcus Hook, failed to comply with the agency’s Oct. 29, 2018, order to stabilize the site of the Revolution pipeline explosion, which was caused by a landslide on the steep hillside in Center Township where the pipeline was buried. McDonnell said the hold will continue until the operator corrects its violations to DEP’s satisfaction. Energy Transfer said in a statement that it is "committed to bringing this project into full compliance with all environmental permits and applicable regulations. Gov. Tom Wolf used the moment to call for a broader review of Energy Transfer’s operations in the state, including urging the Pennsylvania Public Utility Commission to require the company “to address lapses in communication” with public safety agencies along the Mariner East pipeline route. PUC investigators recently required Energy Transfer to evaluate the remaining safety life of its largely parallel Mariner East 1 pipeline _ a nearly 90-year-old former petroleum products pipeline that was reengineered in 2014 to bring ethane and propane from Marcellus and Utica shale wells to the East Coast. The study was required in response to a leak on the line in Berks County in 2017. Mariner East 1 has been shut down since Jan. 21 when a sinkhole exposed the pipeline in Chester County. Pipeline safety investigators are reviewing the site’s geology before allowing flows to resume. Some of the approvals Energy Transfer needs from the Department of Environmental Protection _ now on hold _ are related to earlier sinkholes and spills during construction of the Mariner East 2 pipelines in the same area. DEP has issued more than 80 violations and levied nearly $13 million in fines against the project so far. The 45-mile Revolution pipeline exploded a week after it was activated. It was built to carry natural gas from deep shale wells through Butler, Beaver, Allegheny and Washington Counties to an Energy Transfer processing plant. The rupture burned down a home, displacing a couple and their 10-year-old niece. It also destabilized the hillside’s already unsteady earth, which the company has struggled to secure during the last five months. Some conditions had improved during recent inspections but others worsened, DEP’s reports said.